Flow cytometric analysis of Jurkat cells treated with U0126 (10uM, 3hr; blue) or treated with TPA (200nM, 30min; green) using Phospho-MEK1/2 (Ser221) (166F8) Rabbit mAb (PE Conjugate) (solid lines) or concentration-matched Rabbit (DA1E) mAb IgG XP® Isotype Control (PE Conjugate) #5742 (dashed lines). 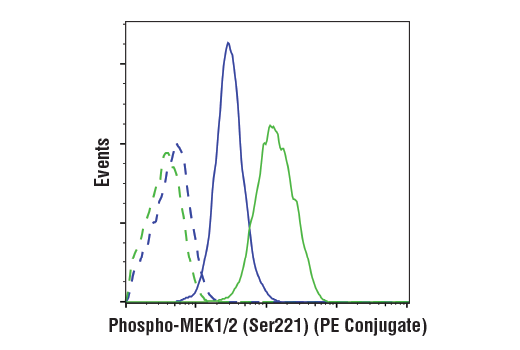 Phospho-MEK1/2 (Ser 221) (166F8) Rabbit mAb (PE Conjugate) detects endogenous levels of MEK1/2 only when phosphorylated at Serine 221. Monoclonal antibody is produced by immunizing animals with a synthetic phosphopeptide corresponding to residues surrounding Ser221 of human MEK1/2. This Cell Signaling Technology antibody is conjugated to phycoerythrin (PE) and tested in-house for direct flow cytometry analysis in mouse cells. This antibody is expected to exhibit the same species cross-reactivity as the unconjugated Phospho-MEK1/2 (Ser 221) (166F8) Rabbit mAb #2338. MEK1 and MEK2, also called MAPK or Erk kinases, are dual-specificity protein kinases that function in a mitogen activated protein kinase cascade controlling cell growth and differentiation (1-3). Activation of MEK1 and MEK2 occurs through phosphorylation of two serine residues at positions 217 and 221, located in the activation loop of subdomain VIII, by Raf-like molecules. MEK1/2 is activated by a wide variety of growth factors and cytokines and also by membrane depolarization and calcium influx (1-4). Constitutively active forms of MEK1/2 are sufficient for the transformation of NIH/3T3 cells or the differentiation of PC-12 cells (4). MEK activates p44 and p42 MAP kinase by phosphorylating both threonine and tyrosine residues at sites located within the activation loop of kinase subdomain VIII. Crews, C.M. et al. (1992) Science 258, 478-480. Rosen, L.B. et al. (1994) Neuron 12, 1207-21.